We’re delighted to learn that The Met, and our annual festival Head For The Hills, have been nominated for 6 awards at two fantastic ceremonies coming to Manchester this winter. The Northern Soul Awards launched in 2017 as an independent celebration of cultural and entrepreneurial excellence in the North of England. We were proud to win awards for Music Festival of The Year and Small Music Venue of The Year for The Met at the inaugural ceremony, and this year we’re thrilled to be in the running for Festival of The Year, Small Business of The Year and Venue of The Year. The Met and Head For The Hills are also in the running for prizes at a brand new, high profile awards ceremony celebrating the best of our city. The This Is Manchester Awards 2018 have been created to showcase the incredible talent in the city. The ceremony takes place at The Hilton Hotel in Manchester on 8 November. 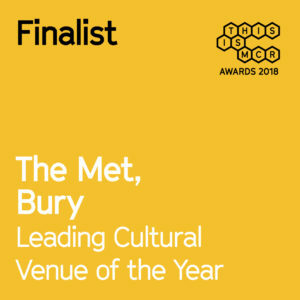 The Met is on the shortlist for Leading Live Music Venue (where we’re nominated alongside giant venues including Manchester Arena and Lancashire Cricket Ground) as well as Leading Cultural Venue. Head For The Hills is shortlisted for Leading Live Event alongside some other fantastic events with truly global reach, including Soccer Aid, Manchester Pride and the One Love Manchester concert. You can see the full list of categories and nominees at https://www.thisismanchesterawards.com/award-shortlist/. Both sets of awards will be decided by expert judging panels including some big-names from Manchester’s culture and entertainment worlds. We’re proud to be ranked among the biggest and best events and venues in Greater Manchester and look forward to hearing more from the judges. Follow Us On Social Media To Find Out If We Win.